Mangifera indica – also known as Mango – seems to play an important role on this Caribbean island. Not only is it available on nearly every street corner, it also had a major part in the Economics for Entrepreneurs Class given by Katja Krafczyk and Felix Harms. Like every morning, the students as well as the instructors had to travel to Université Quisqueya from their houses and hosts. For some students it takes as much as two hours to get to class. As the traffic is always busy during rush hours, classes usually start a little later. But the mixture of the local Caribbean culture and the high motivation of the participants makes nobody ever complain about it. To explain the basics of Economics, Katja and Felix used a simple and common good: Mangos. What does a supply and demand curve look like? What happens if I raise the price of the Mangos I am selling? How can I use the imperfect market to increase the profit I make with my fruits? In groups, the students were asked to apply the content that they learned in class to their businesses. What is the best price, given the fact that I want to maximize my profit? The participants came up with lots of ideas and strategies that were discussed enthusiastically. In the evening the speakers joined the local Rotary Club at their weekly meeting to inform about the first results of the camp. The Rotary Club de Petion Ville was and still is highly supportive for the camp. To summarize this day – by using the Mangos as a commodity, the participants got introduced to the basics of economics. During the class, not only the students were able to learn from the speakers, but also the speakers were able to gain insights about the Haitian market. This entry was posted in Profile and tagged economics, entrepreneurship, felix harms, haiti entrepreneurship camp, katja krafczyk, mangos on June 12, 2014 by Entrepreneurship Camp. Do you ever get frustrated when you do everything you can to accomplish a dream that you hold dear, but all odds turn against you? If yes, that’s exactly how Nicholson felt- a very highly determined and motivated entrepreneur who is participating in Haiti Entrepreneurship Camp 2014 – frustrated and discouraged. Once he graduated from high school, he wanted to study medicine abroad. He decided to apply for a scholarship, but he was rejected at least twice. One day, a friend lent him a motivational book. After reading this book, Nicholson decided to create opportunity for himself. He accompanied a friend to go visit a place where he could buy goods to sell. There are opportunities in every difficulty, and to him it was an opportunity to start his own business. That was the day that changed his life. A spirit of entrepreneurship found its way in him. With no capital, he was cherishing his business idea. He asked advice from his friends. Some of them were negative towards that idea, but he decided to listen to his heart and took the risk. One day, he gathered together a group of friends and set up a “SOL”. SOL in the Haitian Creole is defined as a group of people who put together the same amount of money. One of the group members is responsible to hold the money. Every week, a group member is selected to receive it. Nicholson was the first to take the money, then he decided to invest it in his own business. Now, 90% of his income comes from his business. He imports mainly cleaning products from Dominican Republic, then sells them to his friends, and neighbors. Now his goal is to attract more customers; therefore, he comes to participate in Haiti Entrepreneurship Camp 2014 to enhance his marketing skills and develop a good market strategy. Nicholson made his idea feasible because he didn’t sit around waiting until he was one hundred percent confident and certain about his business idea. He took the risk because to him, no risk, no reward. 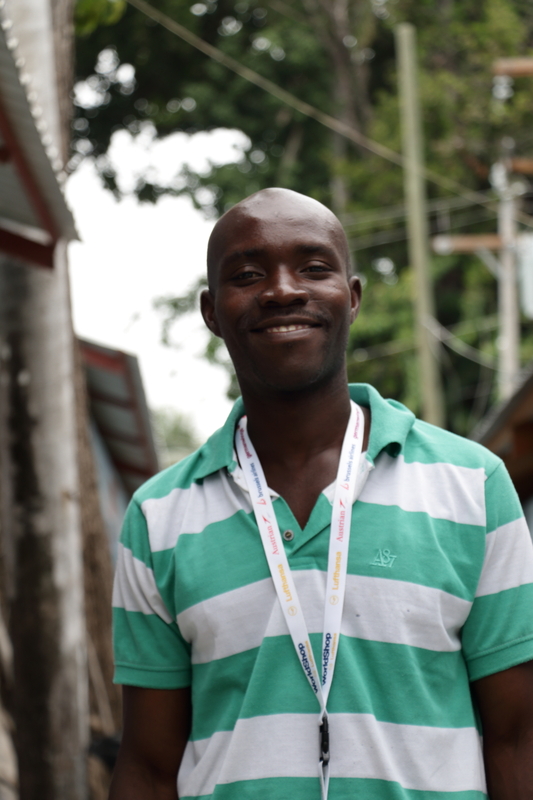 This entry was posted in Profile and tagged entrepreneurship, haiti entrepreneurship camp, nicholson laguerre, participant on June 10, 2014 by Entrepreneurship Camp. Flore Somon is aspiring to open her own honey company in the footsteps of her grandfather, whose own honey business failed due to issues with location. She is interested in honoring her grandfather’s tradition by producing handmade high-quality honey, which she has discovered through her research has therapeutic properties and is good for the skin and general health. Her long-term goals include plans for national production. Flore chose to attend this entrepreneurship workshop to learn more about how to plan and prepare a startup, and to get feedback from professionals and fellow participants on her ideas. Flore studies informatics at École Superieur Infotronique d’Haiti. She loves nature, and is proud of her Haitian culture, and wants to make the best possible product for her people. This entry was posted in Profile and tagged entrepreneurship, flore sanon, haiti entrepreneurship camp on June 7, 2014 by Entrepreneurship Camp. Many people have business ideas. Ideas they think that will impact a certain target group. But how do they know that they certainly will? 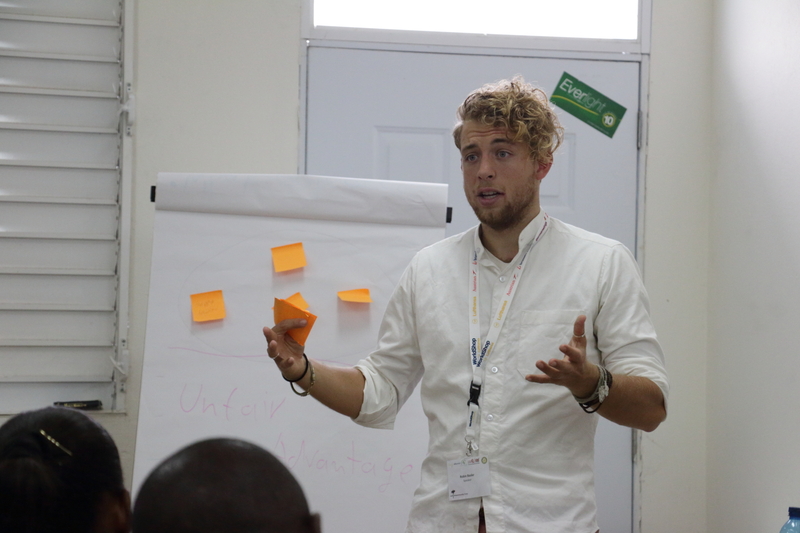 To some people, it is a mysterious process, but Robin Balser – a young entrepreneur from Germany – showed the keys to success today at Haiti Entrepreneurship Camp 2014. Robin used the Business Model Canvas as a tool to allow them to come up with ideas of how they would describe, design, challenge, invent, and pivot their business model. He broke the class in small groups and have them identify a certain problem and bring up solution to it. Then, he had some one-to-one sessions to provide guidance on how each participant can improve specific areas in his business. To him, it is critical to assess the attitude and behavior of the potential customers, and identify the need there is to meet because life is too short to build something nobody wants. Robin worked for the Startup Accelerator Startup Wise Guys in Estonia and in London. Part of this was being a representative holding workshops and speaking at: Creazone.it in Vilnius, Lithuania. This entry was posted in Uncategorized and tagged business model canvas, business models, entrepreneurship, haiti entrepreneurship camp, lean model canvas, robin balser, speakers, startup on June 5, 2014 by Entrepreneurship Camp.